A while ago Fréderic Machu did invite me and some friends to do some minature photo shooting for his upcoming rulebook Congo. Tilman was so kind to recommend us to Fred, since he knew about our Darkest Africa Campaign a while ago. 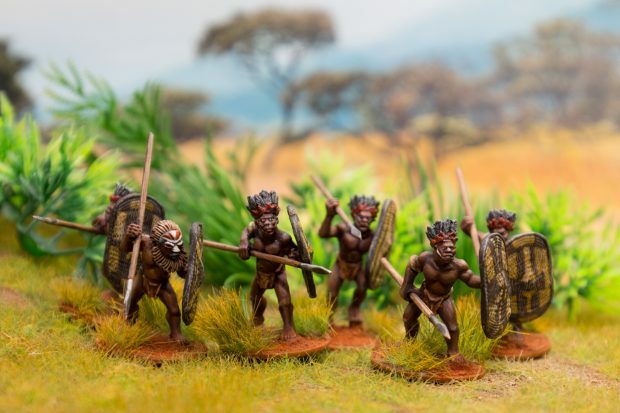 So we did some pictures for the rulebook in two sessions with our friends with Africa miniatures. It was really a great time and we were very happy to see most of the pictures in the wonderful rulebook. Personally the rule book really hooked me and I am preparing my own African Kingdom column with the wonderful miniatures by Wargames Foundry. Here you see a quick shot of my first models, which are my first test for dark skin and african soil and vegetation. I think there is still some more color expression possible, but I will try to improve that with the next models. The shields are painted on both sides, an important detail I luckily read on Dakka Dakka. 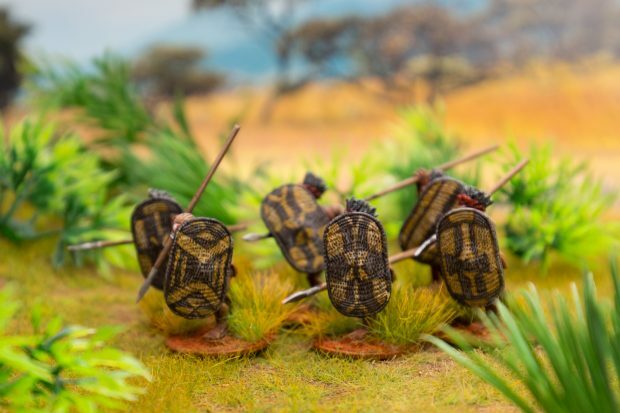 So the first Warriors were really fun, the shield designs were inspired by real Azande shields. Since this is roughly 20% of a full column I am pretty sure that we can play soon. Grandios! Die Haut sieht absolut klasse aus. Der Typ mit der Maske ist ja wohl ein absoluter Hingucker. Gerne mehr davon.